I love horses. In fact, I was called horse-crazy by more than one person (and most often by my mother) when I was growing up. I talked about that in my Year of the Horse post. You can imagine my delight, then, when a friend of mine who owns five horses offered me the opportunity to work with her older horse. After all, she can’t ride more than one at a time and has been spending her time molding the daughter of said horse into an exemplary mount. My acquiescence was swift and sure. After all, I spent years daydreaming about grooming, training and riding horses. The beautiful bay she offered me has the strawberry-blond mane I adore. It’s like dying and going to Heaven with horses. Or perhaps it is living in that other place, surrounded by horses laughing and jeering at your ineptitude. No, that was only in my nightmare. First off, I get confused which way the halter goes. I know. Lily is looking at me thinking, “How stupid is this person?” My actions inform her that my stupidity level is high. Hallelujah, I managed to put the thing on correctly in one try on my third outing with the horse. Don’t celebrate too loudly. I also had to chase her down before she would let me put it on. She stood still while I took her fly mask off, but while I was tucking that in the safety of my back pocket, she decided she was done with our training session for the day. Thankfully, there is no video footage of me holding onto her mane and telling her to stop and stand. She knows both of these commands, by the way, by voice and hand signal. Remember, she’s the smart one in this pairing. 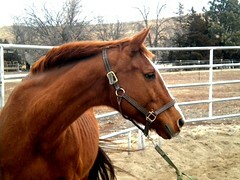 Next hurdle: she knows nothing of neck reining. 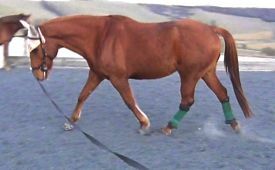 I know nothing of any other sort of rein control, so the first thing I had to learn: English reining. It felt strange at first to have one hand on each side of the reins (a rookie mistake worthy of jibes in the Western world). By my second ride, it was coming more naturally but I still held them too stiffly and Lily let me know it by pulling her head forward. I think she already knows she can trample over the greenhorn. That makes her the boss. Enter lunge lining into the equation. When I can’t ride, I can still build a relationship with her by working with her in the arena. Awkward. This is how I look holding the line and speaking commands to Lily, who would rather be grazing with the other horses. I don’t even know which direction to face. Awkward. It feels awkward to hold the training whip in my left hand and the lunge line in my right. Thankfully, that’s only necessary half the time, depending on the direction she is moving. Awkward. I’m chanting the commands in the sing-song voice my friend showed me. Lily happily complies with “walk on” and “trot.” Cantering is a different story altogether. Now I have to use the whip. I don’t strike it out at her (thank goodness, I don’t think I could hit a horse with a whip on purpose). I send it snaking toward her back legs, while staring at her hindquarters. Apparently, this is supposed to awaken her natural instinct to flee from a predator. I’m not very predatory looking. Eventually, though, the whip on the ground must seem sufficiently scary because she canters, for several revolutions of the line. Hallelujah! Don’t do a happy dance just yet. She refused to canter in the other direction. No matter how snake-like the whip directed toward her hindquarters appeared. She forfeited her treat (which my friend assured me would convince Lily to do anything) and I wrapped up the “training” session early. I failed at my imagined horse woman-ness. As usual, reality bites. It rains on our high hopes and drowns our dream worlds. What is your experience with reality destroying dreams? Perhaps you are a true horsewoman (or horseman) and have advice for future training sessions. As you can see, I need all the help I can get. You story cracked me up. Just remember, all the greats started out the same way. I’d be just as lost. I’ve always ridden horses already saddled up and ready to go. I think your tale was endearing, and by all means, keep living the horse dream. The more you do it, the better you’ll get. Also, I think Lily had an attitude. You know, they’re just big doggies, right? I love horses too, but know very little about them so most of what you said went over my head—except the parts about how the horse had a hoof up on you. HI-larious! !